What Can I Do for Climate Change? ​​What can I do for Climate Change? Why become an Eco Champion? Because throughout the world a serious struggle is going on to defend against the disasters which go hand in hand with climate change. ​ Because if action is not taken now, future generations will look upon this age as being the one which destroyed their lives. ​ Transform our world now - simply by small acts we make in our daily lives. Make and keep this promise to change - and be an "Eco Champion". ​ An Eco Champion is a true citizen of the future. ​And the future is now. About three-quarters of the electricity generated in the UK comes from power stations fuelled by fossil fuels. Many people are switching to green energy - ask your supplier what their plans are for you! If you shower, cut your shower time by 2 minutes - if millions of people do that - wow! When washing hands, turn the tap on while you soap your hands, then turn it off until final rinse. These are just a few ideas from our own Eco Champion, you may have some of your own – tell us your Views and Comments! 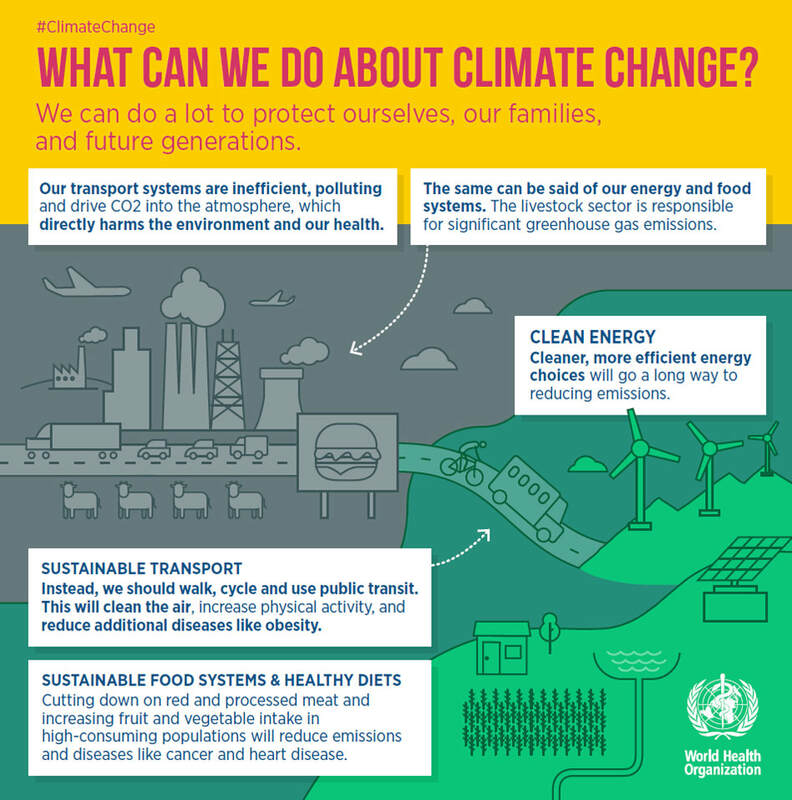 World Health Organisation poster showing what we can do about climate change.